Some good and some bad in the last winey week, the good news being that even the bad was good. This may be confusing, I know. I’ll come back to that. We’ll start with the good, though, and a terrifically successful few hours spent focusing on the produce of the Valle d’Aosta, an obscure corner of Italy which is home to some even more obscure grapes, including Petit Rouge, Vien de Nus, Fumin and Petite Arvine. It’s perhaps a shame, then, that my favourite wine was made from probably the least obscure white grape of them all, but them’s the breaks. They don’t make a lot of wine in the Valle d’Aosta. It’s a bit hard to find out precisely how much, as the only English-language statistics I can find give the region’s annual production of grapes in quintals, which is a bit like them giving the price of something in florins. But for what it’s worth they produced 24,000 quintals in 2008, making it the smallest wine region in Italy by a very long way (about a fifth of titchy Liguria, and a 20th of poky Molise) and putting its production at 0.22% of the largest, Veneto, home to all those oceans of Pinot Grigio. On further investigation it seems that in 2011 the Valle d’Aosta produced 13,000 hectolitres of red wine, enough to fill 1.7 million bottles, and a little over half as much white. That’s not a lot of wine, not really. The entire region produces as much wine as Dom Perignon, or the American zinfandel specialists Ravenswood. My first experience of Aostan wine came when I happened upon a bottle of fabulous Fumin at Les Caves de Pyrene, and I’ve since bought every wine from the region I’ve seen. Both of them. Those selfish Italians drink most of the little wine they make, leaving but a tiny trickle for us over here. There are excellent reds, and some delicious sweet wines (my favourite, a moscato passito from La Crotta di Vegneron, isn’t available outside Italy) but the whites we tried were all bright, clear, and full of the somewhat hard-to-define quality winefolk call minerality. 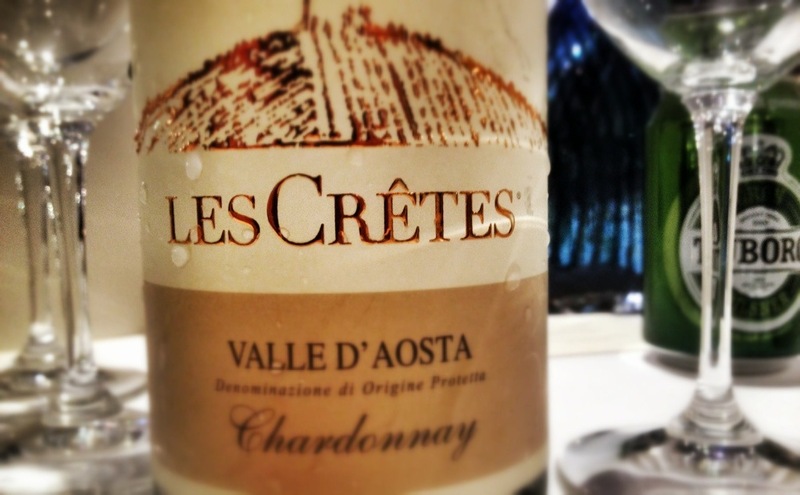 I particularly loved Les Cretes’ unoaked chardonnay, as bright and joyful an expression of this often overlaboured grape I’ve had in a good while. The best price I can find it for in the UK is £17.08, when bought by the case from Winebear, which is quite a lot for such an unpretentious wine, but it seems to cost around £9 locally, making it as good a reason as any to drive to Italy. If I had a big party to organise this year I’d be hiring a van and booking a ferry right now. The same producer’s Fumin is also excellent, and definitely worth sticking in the boot, given that you’re driving through. Now, the less good. One of the problems of being constantly and quite successfully in the search of wine bargains is that you can forget, or not even realise in the first place, the value of some of the stuff you own. And so it was that on Monday I poked around the wine fridge for a simple wine to share with Mrs CF over dinner and produced something procured from I don’t know where for I don’t know how much that looked suitable. In a flash the cork was out, glasses produced and … as soon as I poured it I knew something was up. It was so much darker, fuller, deeper than I expected. And then, the smell. And the taste. This boy was smooth, the kind of smooth that requires several more than the traditional two O’s to express. It was smoooooooth. It was a wine to dive into and submerse yourself in. One so alluring, so totally lacking in nasty corners or poky thorns that might put off even the very occasional wine-drinker, that it would be certain to impress a tableful of important guests. And so to wine-searcher, where I found that it costs £39.99. That makes it perhaps the most expensive wine I own, or very close, and totally inappropriate for a Monday evening a deux. It was my only bottle. It’s gone. It was good. I want more. I won’t get it. Bah.